Greek and Romans already used aquamarine in jewelry in the 3rd century BC. Intaglio’s, an engraved or incised scenery, often of the sea, were set in brooches. In the past it was believed that aquamarine protected ocean travelers during their long trips and assuring them a safe return home. Therefore this gem is also known as the ‘sailor’s gem’. Aquamarine belongs to the beryl family, like emerald (green), morganite (pink) and heliodor (yellow). The less well-known family members are goshenite (colorless) and bixbite (red). Aquamarine is found in different places around the world but Brazil is the most wellknown place to find this blue gem. 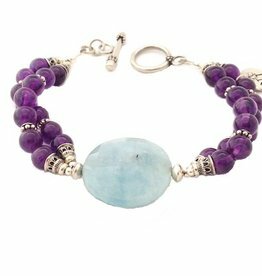 This gemstone does have a calming effect on the wearer and it protects also when traveling. Chakra: 5th or throat chakra. The aquamarine belongs to the zodiac signs Aquarius, Pisces, Gemini and Libra. Aquamarine is the birthstone of the month February. Handmade unique sterling silver clear aquamarine ring, baguette cut, ring size 55. A bracelet with two strings high end natural turquoise and aqaumarine beads. 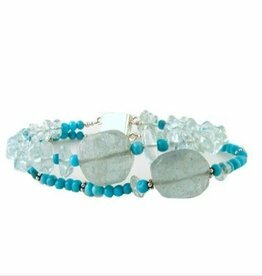 Beautifully handmade and designed by NJAmsterdam aquamarine bracelet with a gorgeous milky aquamarine as eye-catcher. 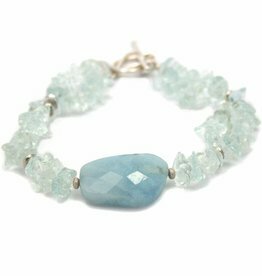 Bracelet made of aquamarine, morganite and green beryl with sterling silver clasp. 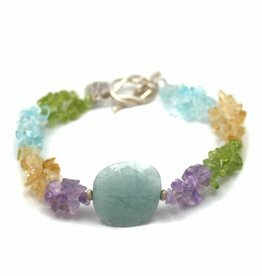 A handmade bracelet of aquamarine, morganite and green beryl. Bracelet with a 'milky' aquamarine as eye catcher between rudraksha beads and aquamarine donuts. Handmade beaded bracelet aquamarine and rudraksha with sterling silver ornaments. Length bracelet 20 cm. Silk necklace with sterling silver aquamarine pendant.